VG: in very good condition with rubbed and chipped dust jacket. 210mm x 130mm (8" x 5"). 190pp. Very Good. New York, 1936. Glossy black boards with gold spine titles; mild edge wear; jacket is worn, with small chips and tears along edges, now in clear plastic for protection; 8vo, 7 3/4" to 9 3/4" tall; a few random pencil marks in margins, otherwise unmarked; 287 pages. 190p., very good first printing UK reissue of completely reset edition in yellow cloth boards and unclipped uniform dj. Originally published in 1936. No lesbian content. Used: Good. Foxing to end pages, spine rubbed, head and heel worn. HALL, Radclyffe. 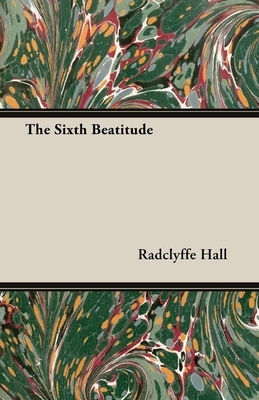 THE SIXTH BEATITUDE. London: William Heinemann Ltd., 1936. Small 4to., vellum leather spine & green cloth boards, top edge gilt, gilt lettering on the spine; other edges deckled. Signed, Limited Edition of only 125 numbered copies, each signed by Hall. This is copy #119. Hall [August 12, 1880-October 7, 1943] was a lesbian English poet and author, best-known for her lesbian classic "The Well of Loneliness", which was listed number seven of the top 100 lesbian and gay novels, compiled in 1999. Hall was also listed number sixteen in the top 500 lesbian and gay heroes in The Pink Paper. Read her biography-she was a fairly prolific lesbian lover during her lifetime. Very good (a nice binding but with some scattered darkening & few scuffs to spine; contents cleans & tight but with foxing to the verso of both the front & rare endpapers); comes with the original cardboard slipcase, which has some wear & browning but copies in the original slipcase appear to be uncommon! Personal armorial bookplate of R.L. Spears on the front pastedown & small ink initial (ending in S) on another page. $350.00.